I would like to add another castle to your list. I don't know the name of it but I do know that it was built by Dr. Stuart Wallace. The castle is located off of Lewis Road on the Meramec River in St. Louis County. As a carpenter, I had the opportunity to visit this very secret and well protected jewel of architecture. This much of the story is true but the rest is heresay surrounded in scandal. Dr. Stuart was a dermatologist of questionable passions of desire. He acquired a magestic estate of magnificent beauty overlooking a picturesque bend of the Meramec River. On his property was an old house built around the time of the St. Louis Worlds Fair in 1904. Dr. Stuart essentially had a castle built around this old structure completely enveloping it. I have no idea what the old house looked like but the castle looks awesome, although it was in advanced stages of disrepair when I visited it in the summer of '98. 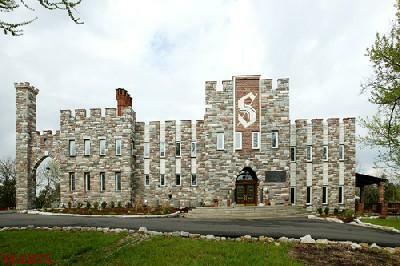 The story that I was told was that Dr. Stuart built the castle as a shrine of his love to his beautiful wife. For whatever reason, she left him and he was devastated. He essentially fell off the face of the earth and disappeared for several years, supposedly leaving the country for Europe. When he finally resurfaced, his broken heart could not permit him to return to the estate. He! put it up for sale with one stipulation in the deed, whoever bought the the property could not tear down the castle but would have to restore it.. The building stood vacant for over 20 years. Dr Naresh Misir and Nancy Misir finally purchased the property and were in the process of rehabing it. I was estimating a bid to replace 5 garage doors on the lower level that were so delapitated, there was around 2 feet of dirt that accumulated against the outside of the doors. Trees were growing in the driveway and in the castle itself. I could not resist the compulsion to explore the mysteriuos ruins. What I saw was starteling. The floors had pressure sensitive strips, under the carpet, to show where a person was walking. There were secret passages throughout the entire living area with inconspicuous peep holes into the rooms. On the top floor, surrounded with windows, was what appeared to be a command center with heavily secured doors. I was told that Dr. Stuart was affraid that someone or something was out to get him, so I guess this was his fortress against his paranoia. ! The kitchen area gave me the creeps when I walked in because there were granite stones in the walls, with bizzare phrases inscribed. It appeared to be like a mouseleum! Then there was the basement with two foot thick concrete walls. This place gave me a really bad feeling because it looked like a dungeon or a torture chamber. I could hardly wait to run up the stone spiral stairway to get back in the sunlight. At this point, I was on a large patio area, half outside and half under a two story roof. There were strange suspended beams and other weird things hanging from the trusses, long forgotten. Across the patio was the tower. Over three stories tall, the stairs had long since rotted away into a pile of rubble at the base. The view must have been awesome for an oncoming siege. The castle that gentleman is describing is known as the Stuart Castle. It is located in Eureka, MO. I believe my mother sent an e-mail upon discovering this site. I am the only child of the family that occupies this window into the past. It has been quite an ordeal finishing this castle. It is very well known in the area and was used as a party site before we purchased the home. The house isn't as creepy as the person describing it makes it seem. Yes, it is true we have hidden passage ways and rooms, and that there are peep holes all around. This is a very comfortable place to be. Although being constructed of solid granite blocks (interior and exterior) and having granite stone floors (interior) it can be a rather difficult (and expensive) place to heat. The castle is located on 6 acres overlooking the Meremac River. The view from the 3rd floor Penthouse Suite (my room) is phenomenal! I can see the fireworks from the local amusement park from my bedroom window during the summer and the snow covered slopes from the local ski resort in the winter. The house is 12,000 sq.ft. total. It consists of only 4 bedrooms, 4 full baths and 2 half baths. Don't let the minuscule number of bedrooms fool you on the size. This is indeed a grand estate. Just to give you an idea of the size, most people's homes would fit in out living room or game room alone. My bedroom is 500 sq. ft. and the master suite has a private Romeo and Juliet balcony, an office, a yoga room, and a bathroom the size of most bedrooms. We have 3 separate sunrooms on the 2nd floor. One is attached to one of the guest rooms. Both guest rooms boast of a full size bath. Every shower in the house is tiled with travertine marble. Total the house consists of about 14-15 rooms (including the sunrooms not attached to the guest room) Hopefully I can scan some pictures for you. The house was in complete disrepair when it was purchased. It did go through a complete gut rehab, down to the subflooring. Many interesting things were found in the process of rehab as well. One of the most interesting is the bookcase the swings out to reveal a set of stairs that leads to the working basement. There is almost too much to describe here. It would be much easier to send pictures. I'll have to find some in all the different stages of development. Hope this gives you more information about this location. We have been interviewed for a local paper thanks to your web site and that should be published in Aug. Also, we will be on HGTV sometime this summer.